Straight from Samsung's pretrial briefs come more and more nuggets of information that shed the light around the iPhone and iPad design conception, and we are comfortably on the couch, popcorn in hand. How much did the iPod influence your design? Morisawa: When I started this project, that was my concern. I looked at the first Walkman [which debuted in 1979]. Then I thought, "How can I give shape to the music?" Music doesn't have shape; it's flowing. I was listening to music and waving my hand in the air. I thought there shouldn't be an end to its lines. So I started drawing a round shape, and I kept moving the line. My team had shown me their sketch: It was a square with a screen and buttons. Most other players have a screen and buttons. My first mock-up didn't have buttons. I didn't want buttons. With any digital-music player, the hard disk drive and chips are similar. I thought, "How can we make the layout different?" I knew what would go inside, so I could start the design from the outside. I knew how big the hard disk drive would be, how many chips there would be. What challenges did you face in making sure the final product would look like your sketch? Morisawa: It's really tough to make something round. You can't really measure where the components are inside [the device] when using the CAD [computer-aided design] system. I didn't want the engineers to change the shape or the size. I didn't want something larger than this; it fits in your hand. I thought it had to be smooth on the back. The engineers wanted to make the back side flat. But I didn't want the flatness to bother you when you're listening to the music. I made two physical mock-ups for engineers so they could feel the difference. That's how I convinced them to keep working on this. Afterward, the engineers joked that they didn't want to work with me twice in a row. 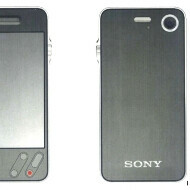 Looking at the original "Sony-style" design drawing from 2006, what do you think, will Samsung's argument sound plausible in court when trial begins? Wow, this is exactly like iPhone's "iconic" design LOL. How shameless Apple is. Apple made it famous. others couldnt. Oh man, please get a life! Ok, so it's ok to steal ideas as long as they're not popular. Is that it? Actually, I think you feel it's ok to steal ideas if you're Apple, and only Apple. I was gonna say the same,f*ck me the iphone looks extremely similar. Funny thing is it took apple several years to actually reach this level of design with the iphone 4.
lol....this is nothing new tho: http://gizmodo.com/343641/1960s-braun-products-hold-the-secrets-to-apples-future Its really funny tho.....that amazing, innovative iPhone 4 design was ...copied....just like what they did with Braun products. Well others tried. But failed. Apple took it and cause the world a damage. Like no others has. What a joke. more like you all jelious... get over it loooosers! Face the facts and logic. Apple is Apple like no others. More like you all Trolling. More like you dumb like rock. pls get a life and stop being jelious of Apple. Get over it. jealous of apple, that's the best you could come up with, try again.......it would be better if you could spell jealous correctly. i think you need help. get wize councelling. Yeh apple did damage --> to your brain. ur more damaged. cause u hate Apple. so u need to get over it. Money...you are clearly blind, mentally disabled and you have "poor Engrish". A real nice triffecta. You need to pull your head out in the sand. Unless you have hundreds of thousand of apple shares. Apple lawsuit would not bring you a single benefit. Less competition mean more pricey apple product. Apple recent price reduction in ML, iPad are the result of competition or because apple is feeling charitable. iFan will believe all the marketing info feed to them by Tim Cook. Apple were first to design this. Every-one is Xeroxing Apples design. To many copycats! Apple had lead will lead have lead allways will others will follow us!!! Others dont have the equity to patent. Apple will has paid double triple the cash amount.